BOSTON – The First Circuit refused to reopen immigration proceedings for a Chinese man who waited nearly 14 years to challenge his removal, saying he failed to show that Christians in recent years have faced increased persecution in China. In a published decision, a three-judge panel for the appeals court denied the petition of Xin Qiang Liu, a converted Christian who had sought asylum in the U.S. based on the fear he wouldn’t be able to freely worship if he returned to China. Liu argued that although the deadline for filing a motion to reopen his case had long since passed, he was entitled to an exception because conditions in China had changed for the worse since he was ordered removed in 1998. Writing for the panel, Circuit Judge Juan R. Torruella said the lower court didn’t abuse its discretion when it found the treatment of Christians in China hasn’t gotten substantially worse since Liu came to the U.S. The circuit court also said the Board of Immigration Appeals was correct to rule that Liu’s conversion to Christianity in 2011 was a changed personal circumstance, which can’t serve as the basis for a motion to reopen based on changed country conditions. Liu’s attorney, Joshua Bardavid, said they were disappointed in the decision and reviewing their options. According to the opinion, immigration authorities started removal proceedings against Liu shortly after he came to the U.S. through the Virgin Islands. He was ordered removed in 1998 after he failed to appear for a hearing in front of an immigration judge. Despite the order, he continued to live in the U.S. for almost 14 years, eventually filing a motion in 2012 to rescind the removal order and reopen his proceedings. He argued, in part, that his former attorney was ineffective and failed to tell him about the hearing in 1998 which led to his removal order. He also said he feared returning to China, citing news articles and media reports documenting Christians’ persecution. Liu appealed to the First Circuit after an immigration judge and the BIA refused his requests. Ruling Friday, the appeals court said Liu’s attempt to revive his case based on ineffective counsel was much too late. However, he may have been entitled to an exception that allows motions to reopen to be filed at anytime if the individual seeks asylum based on changed circumstances in their native country. But the panel said Liu’s arguments in this respect failed. Citing a “Country Report” from the U.S. Department of State, the judges said religious activity in China were restricted in 1998, which in some cases included illegal churches being closed, their leaders detained and property destroyed. The same report 14 years later said the “government continued to strictly control religious practices and repress religious activity” outside that which had been approved by the government, the panel said, emphasizing the word “continued.” “Therefore, the [immigration judge] properly determined that Liu’s evidence did not establish the ‘intensification or deterioration of country conditions,’ but rather their ‘mere continuation’ based on her comparison of the 1998 and 2009 State Department Country Reports,” the panel wrote. 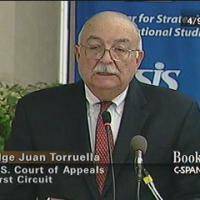 Circuit Judges Kermit V. Lipez and David J. Barron joined Judge Torruella on the First Circuit panel. Liu is represented by Joshua Bardavid of Bardavid Law. The federal government was represented by senior litigation counsel Holly M. Smith, Assistant Attorney General Stuart F. Delery and senior litigation counsel Eric W. Marsteller of the U.S. Department of Justice’s Office of Immigration Litigation. The case is Xin Qiang Liu v. Loretta E. Lynch, case number 14-1159, in the U.S. Court of Appeals for the First Circuit.